It’s the time of year for red roses, heart-shaped candies, and taking your significant other out for a perfect Valentine’s Day meal. Wondering where and how to spend Valentine's Day in Ocean City? We've put together a list of Valentine's Day dinners, hotel packages, and things to do in town to celebrate with your special someone! One of the best ways to show someone you truly care is to take them out for a wonderful dinner on Valentine’s Day. 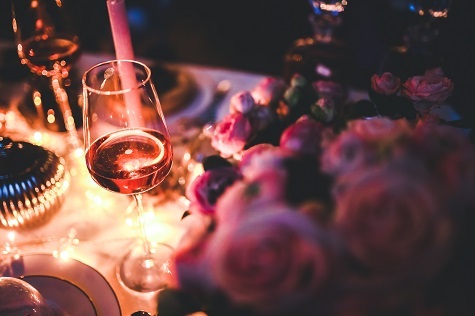 You can’t go wrong with a dozen roses, delicious food, and a few glasses of fancy red wine! Numerous restaurants and locations in Ocean City will have great Valentine’s Day specials this year. Enjoy breathtaking ocean views and a delicious meal the Clarion Resort Hotel to Horizons Oceanfront Restaurant! Two-course ($35/person) and three-course ($40/person) options are available. From Bistro Filet & Lobster to Pan-Seared Rockfish to a Roasted Vegetable Pizza, you are definitely not going to leave hungry! Dry Dock is having a wine pairing dinner this Valentine’s Day! Five tasty, uniquely crafted plates with five glasses of wine paired alongside–a great way to impress your date on this “holiday of love.” Get one ticket for $75, or two tickets for $120. Start your celebration with a complimentary champagne toast at The Shark! All couples who join us will also receive a special Valentine’s gift. Gifts will be guaranteed for all couples who book by Thursday, February 7. All others will be offered gift bags while supplies last. Head to Ocean City’s newest sushi bar in town, Nori! They will be reopening for the season on February 14 so you and your significant other can celebrate with their delicious sushi menu items and champagne. They will be accepting reservations leading up to Valentine’s Day. Join Longboard Cafe for a night filled with tasty dishes that will surely leave you and your date filled with satisfaction. Their three-course prix-fix dinner is only $39, giving you delicious options such as Scallop Creme Brulee, Shrimp Crown Imperial, and the Fresh Fish of the Day "Longboard Style." If you’re heading to town to spend a nice romantic getaway at the beach this Valentine’s Day, you’re coming to the right place! Hotels throughout town like the Princess Royale, Clarion Resort Hotel, and Residence Inn are all offering special packages for the holiday! Boardwalk Hotel Group is also offering a great Valentine’s Day package at any of their three hotels. With your stay, you’ll receive $80 in meal vouchers, flowers, a box of chocolates, and a bottle of wine upon arrival. Along with a “cliche” romantic walk along the beach (it may be cliche but what girl have you ever met that doesn’t enjoy long walks on the beach?!) there are tons of cute, romantic things to do as a couple in town! Jump on a romantic ride along the boardwalk and beach! As the horse and carriage take you on a romantic trip, you’ll also get a red rose, small box of candy, and a glass of bubbly. Rides are $50/couple. Valentine’s Day is the perfect excuse to pamper yourself! Take a couple’s trip to the spa! Choose from Creative Day Spa, Bliss Salon and Spa, The Grand Saloon, A Perfect Face, Acqua Day Spa or others to treat yourself and your loved one.